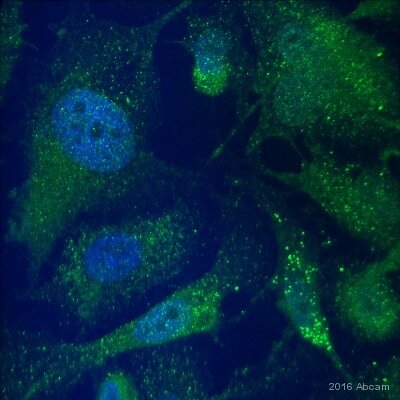 In IGF-1 stimulated LNCaP cells (passage number 38), a ~110 kDa band was observed. The serine phosphorylation site recognized by ab45089 has been alternatively referred to Ser213 (Lee and Chang, 2003) and Ser210 (Lin et al, 2003). Variations in denotation can arise from how the sequence is counted in various GenBank accession numbers. The site is denoted as Ser213 in GenBank Accession No. A39248, which was used to design the immunogen. Our Abpromise guarantee covers the use of ab45089 in the following tested applications. WB Use a concentration of 1 - 4 µg/ml. Detects a band of approximately 110 kDa (predicted molecular weight: 99 kDa). 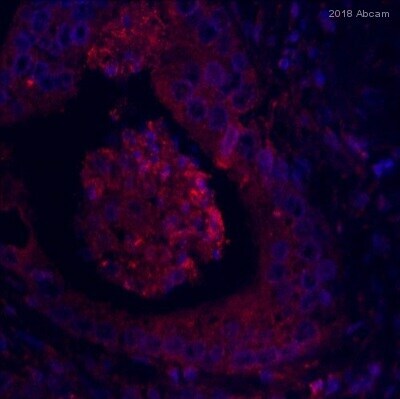 IHC image of Androgen Receptor (phospho S213 + S210) staining in human normal prostate formalin fixed paraffin embedded tissue section, performed on a Leica BondTM system using the standard protocol F. The section was pre-treated using heat mediated antigen retrieval with sodium citrate buffer (pH6, epitope retrieval solution 1) for 20 mins. The section was then incubated with ab45089, 10µg/ml, for 15 mins at room temperature and detected using an HRP conjugated compact polymer system. DAB was used as the chromogen. The section was then counterstained with haematoxylin and mounted with DPX. Publishing research using ab45089? Please let us know so that we can cite the reference in this datasheet.